City department store House of Fraser is wishing everyone a &apos;Harry Christmas&apos; for the second year running by raising funds for charity &apos;HelpHarryHelpOthers&apos;. The store, in Corporation Street, has opened its Santa&apos;s Grotto for 2014 which is collecting cash for the charity launched by Harry Moseley who died aged 11 in 2011 after battling a brain tumour for four years. 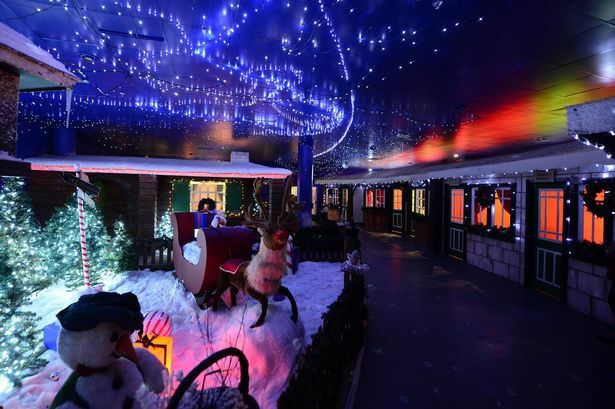 The fifth floor grotto is being run by the charity until Christmas Eve and is home to a selection of traditional style shop fronts from yesteryear and a log cabin for Father Christmas. Harry&apos;s mother Georgina said: "Christmas is a magical time for children and it is wonderful that House of Fraser and Retail Birmingham are supporting this magical experience for children during the festive season. "We are humbled that all proceeds will go to support HelpHarryHelpOthers so that we can in return offer financial support to adults and children affected by any type of cancer." Last year, the grotto welcomed more than 10,000 visitors raising significant funds for the charity. Retail Birmingham, the city centre&apos;s business improvement district, has worked in partnership with House of Fraser to design and create the grotto. House of Fraser store manager Nirmal Madahar added: "We&apos;re absolutely thrilled to be working with HelpHarryHelpOthers again this year, a charity which continues to touch so many people. "The grotto offers a truly magical experience for the whole family and we are delighted that it will open its doors in store this Saturday right up until Christmas Eve."